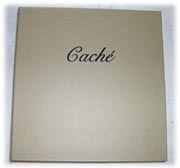 There is a $85.00 fee for the Cache catalog that will be credited to your account upon your first order. The John James Lighting catalog is available as well for a $50.00 charge to be credited upon your first order. Please fill out the form below. You will be invoiced for your catalog and it will ship out upon payment or you can print the form and mail it in with your check. Please make check payable to Cache. Cache does not accept credit cards. We respect your privacy. None of the information collected in this form will be shared with anyone outside of our organization.